November is here and it's the official start of the holiday season. This means there will be many parties and dinners to attend. Of course you can't go to anyone's shindig without a hostess gift in hand. I am a practical gift giver and I tend to give the things I would love to receive myself. One very thoughtful idea is cleaning products. I'm sure you're thinking, "Say what?". Generally the hostess is the one doing most of the clean-up, so why not make their job a little easier with safe and natural products? Nature HomeLogic products are made in the USA, biodegradable, hypo-allergenic and are 100% plant and mineral based. Additionally, Logic Products are free from sulfate, paraben, phthalate, formaldehyde, triclosan, BEG and PEA. Give the hostess the gift of sparkling windows with the ammonia-free Natural HomeLogic Glass Cleaner ($7.75). Wipe away streaks safely and effectively, without any harsh chemicals like ammonia, which is a common ingredient in glass cleaners. It really does a great job and makes you feel good that you're not breathing in any harsh chemicals. You can freely clean around children or pets without worrying. 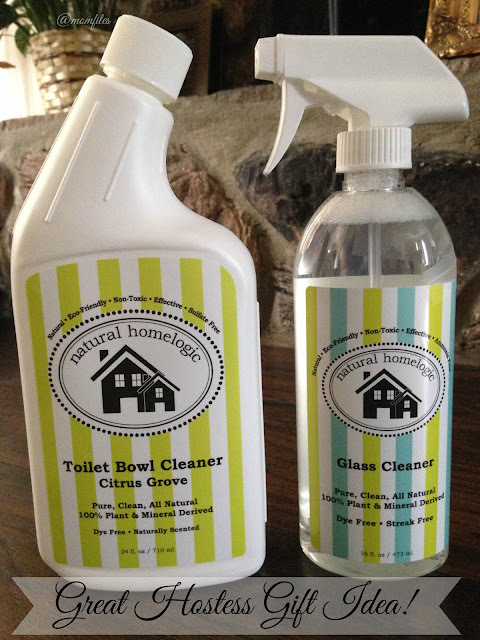 Natural HomeLogic Toilet Bowl Cleaner ($8.00) steps up to the plate providing a powerful and natural clean using nature's finest ingredients. Natural HomeLogic Toilet Bowl Cleaner is made with 100% plant and mineral derived goodness and will bring the sparkle and shine back to even the dirtiest bowl leaving a natural, refreshing and pleasant grapefruit scent behind. Natural HomeLogic offers a variety of products for all your cleaning needs. Check them out on their website and follow them on Facebook and Twitter for products promotions and updates. I think any of their products are the perfect hostess gift. I'm sure the recipient would find it thoughtful too. I received product samples in exchange for my honest review. All opinions are my own as always. This is a good idea! Everyone could use some good cleaning products!